I’ve always been a big fan of hot dogs, and over the last several years fell in love with really good hot dogs, especially Nueske’s style of the hot dog, which they label as a weiner. To me what makes a really great hot dog is its casing, and how it prepared, and to me Nueske’s has both of those. There are so many different style of hot dogs out there, with the classics being the famous Chicago style hot dog, or an infamous chili dog, but I think there is one that goes under the radar a bit, and one that should be exposed, hence why I am posting this, and that is the Sonoran hot dog. The Sonoran hot dog is a thing of beauty. It truly is. Is is basically a great smoked weiner, wrapped in bacon, cooked until the bacon is crisp, then tucked into a bigger bolillo style roll, and loaded with awesome ingredients. This hot dog, as much as I love the Chicago style hot dog, gives it a run for its money. Start by getting a medium skillet up to medium heat. 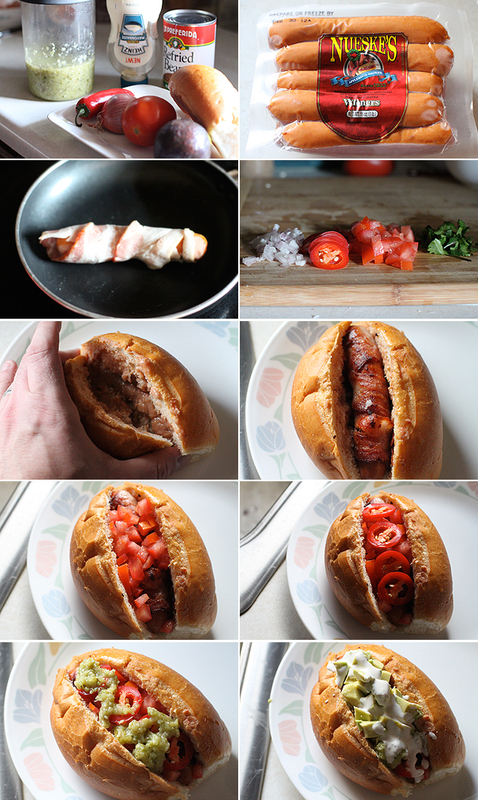 Wrap the bacon around the hot dog and add it to the skillet. During this time, prepare all of your ingredients. Add the mayonnaise to a small bowl and combine that with the milk. Whisk to thin it out a bit. You don’t want a thick mayonnaise here, but something to drizzle, so add more milk, depending on your style of mayonnaise, until it gets a bit thinner. Keep turning the hot dog, cooking for a few minutes on each side until the bacon becomes crisp all around the hot dog. Once you have achieved a crispy bacon coated hot dog, set it aside. Add a layer of the cooked refried beans to the inside of the bolillo roll. Top that with the sliced shallot and cilantro. Add the bacon wrapped hot dog. Top with the diced tomatoes, sliced jalapeno pepper, salsa verde, and avocado. Generously drizzle with the mayonnaise. Sounds like a lot, but it only takes as along as you have to cook that hot dog, roughly 10 minutes or so. Your end result is a bite of wonderland. 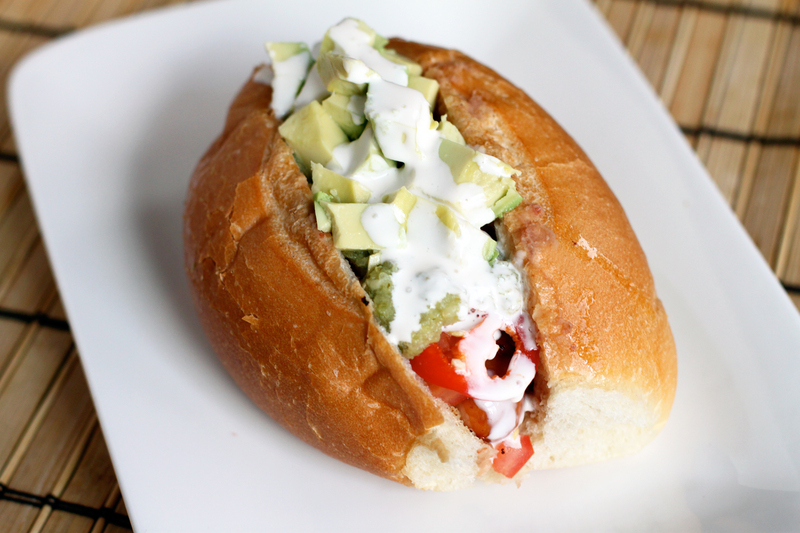 You get the smokiness from the hot dog, and then lets not forget about the bacon, and then the spice from the shallot, and jalapenos gets perfectly balanced by the avocado and mayonnaise. This might, and probably will, give that famous Chicago style dog a run for the competition. Hope you enjoy. Add the mayonnaise to a small bowl and combine that with the milk. Whisk to thin it out a bit. You don't want a thick mayonnaise here, but something to drizzle, so add more milk, depending on your style of mayonnaise, until it gets a bit thinner. ohmyGOSH!!!!!!!! That looks incredible. I’m a huge Chicago style hot dog fan, and can’t *wait* to try this! Thanks! !